Today MATing translates as ‘writing this before I begin to stare through the window’. Sometimes it takes much staring before I can write. 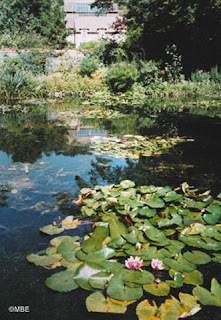 One day Monet was sitting on the bench in his garden at Giverny staring at the waterlily pond. His neighbour walked by, poked his nose over the hedge and said, ‘Bonjour Monsieur Monet, I see you are not working today. There are many things I’d like to talk to you about.’ And he opened the gate and walked in. But Monet didn’t look at him, nor did he speak to him, and after a while the neighbour left in a huff. 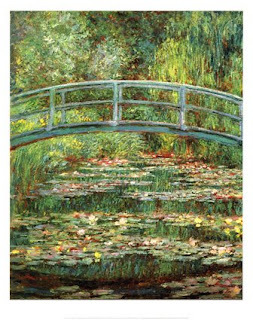 This entry was posted in Writing and tagged how writers artists and musicians work, MATing, Monet, painting. Bookmark the permalink. Good story. So he could do and talk, but not think and talk? I think that’s right. It’s getting started I find hard – that involves much thinking! I think the story also shows that when an artist/writer/musician looks as if she’s not doing much at the beginning of a piece of work, she is actually working very hard; and vice versa when the work is underway (when the fundammental thinking/understanding is done). There can be so much mental preparation before you sit down to write. I remember a former professor of mine who said she used to get her best writing down on the subway home. She would just shut out the noise and focus on what she wanted to get on the page as soon as she got home. Once she was home, she could dive write in. Verbivore, I agree wholeheartedly with your writing professor.